It's not the years in your life that count - it's the life in your years!" This was the theme of the 2012 Retreat led the Revd. Canon Dominic Ind, Rector of St Saviour’s, Bridge of Allan and University Chaplain. Below are some recollections from Elizabeth Clark, a member of Penicuik Branch, who attended the retreat for the first time. Catherine Pow and I attended our first provincial retreat, initially with some reservations, as we weren't sure about the "Greater Silence" commencing after dinner on the first evening! 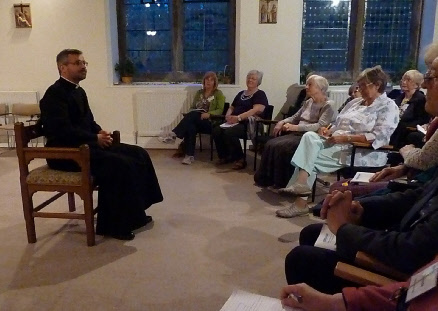 In the event we needn't have worried - we slipped into being silent and comfortable with the opportunity to reflect on Canon Dom's talks on the theme of "It's not the years in your life that count - it's the life in your years!" We enjoyed the retreat, even getting up to be at Morning Prayer at 8 a.m. - the first of four services held daily! It was good to meet other MU members from all over Scotland and to enjoy the hospitality of the Monastery and the wonderful weather we were blessed with. Relationships - I wish I had stayed in touch with my friends. Work - I wish I hadn't worked so hard. Joy - I wish I had let myself be happier. True to self - I wish I'd the courage to live a life true to myself, not the life others expected of me. Using as illustrations recent popular TV programmes like "Call the Midwife" and "Downton Abbey", he also reflected on his own background, being born into a family with clerics and theologians all around. He also admitted to being an "Essex" boy, although long since moved to Scotland with a Scottish wife. He talked of the fact that work is really important and the lack of it, which he had witnessed in different parts of the country - East End of London, North East Newcastle, Glasgow. Work is integral to living but if there is no prospect of getting work it is so demoralising. The opposite problem is that people at the other end work too hard. Dom introduced us to the "The Rule of St Benedict" which provides a moderate path between individual zeal and formulaic institutionalism. This rule has been used by Benedictines for fifteen centuries, but he posed the question, how could that have anything to do with the pressures we have to deal with in 21st century Scotland. Dom suggested that we needed prayer as our heartbeat and to remind ourselves that we in the Church had lots of jewels to share. Our witness is to show a healthy work/play example. Canon Dom has a particular interest in Eastern religions and used Zen Buddhism to illustrate Joy. The Buddha exuded Joy; he had peace and contentment. As a big fan of Whitney Houston, he spoke of her amazing voice, the whole package that she was. She appeared to have everything but she didn't have joy in her life. As a member of the Society of St Francis (SSF) for two years after he left university, Dom had lived by their principles of humility, love and joy. He worked in the community mingling with all kinds of people many with real problems, sometimes cut off from their families for various reasons. He said that these principles should be the basis of our Christian lives. Sister Maureen, a member of the community at Kinnoull, a person with the most wonderful Irish accent, radiated humility, love and joy, as she ensured that we all had enough to eat. Dom suggested we should all aspire to her example. In the final talk about being "True to Oneself" he said we were all actors as illustrated by Shakespeare's "As Your Like It" that "all the world's a stage………" We were then introduced to the Myers-Briggs Type Indicator (MBTI) [I suggest for enlightenment you "google" it]. In simple terms, individuals are either born with, or develop, certain preferred ways of thinking and acting. We are all a mixture and are stamped by our various experiences as well as our innate personalities. Mothers are "givers" but can get so caught up in their children and grandchildren they get lost in the giving. As the theme for the retreat "It's not the years in your life that count - it's the life in your years! ", Jesus came that we would have life and have it in all its fullness (John 10:10). We were on a journey, with the most important week of the Church year, Holy Week, only a few days away. Dom finished by saying "May you have lots of life in your years, however many years you have left!" This picture above was taken at one of the evening talks. More photos are available in the the photo-gallery for the 2012 Retreat, which can be seen by clicking here. If you would like to be added to the email list to be sent details of the 2013 Retreat when they are available, please click here.